Los Angeles Dodgers starting pitcher Walker Buehler has been sensational in his rookie season. The right-hander put together a 2.62 ERA on the season, a 1.95 ERA in September, and threw 6 2/3 one-hit scoreless innings against the Colorado Rockies in the NL West Tiebreaker. So, the Dodgers had to feel pretty good about their chances to sweep the Atlanta Braves in the NLDS on Sunday night with Buehler taking the ball. But the fireballer ran into some trouble in the second inning. 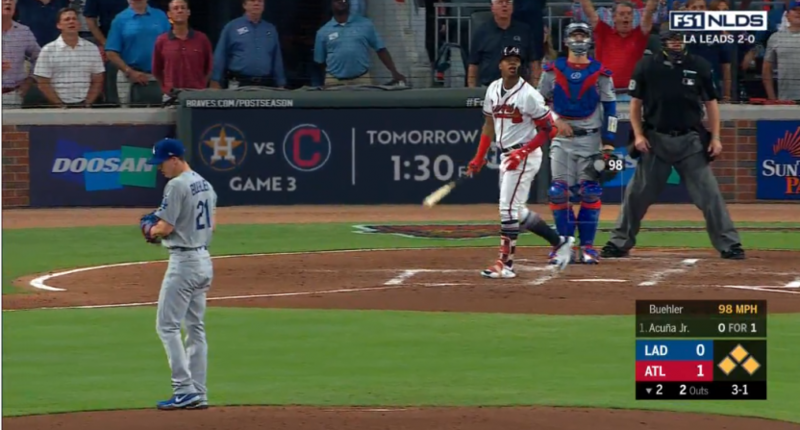 Atlanta’s Nick Markakis walked to lead off the inning, and after Buehler struck out two consecutive batters, the Braves got runners at second and third on a Ozzie Albers single that Cody Bellinger booted. Still, Buehler had two outs and the bottom of the Atlanta order up. While you’d rather have the opportunity to go after the No. 8 hitter and get the pitcher to lead off the next inning, Dave Roberts and the Dodgers understandably didn’t want to mess around in this situation in a playoff game. So the Dodgers chose to intentionally walk Charlie Culberson to load the bases and go after Atlanta pitcher Sean Newcomb. Culberson is a player the Dodgers know very well (he played with them in 2016 and 2017), and he had a rock-solid .792 OPS this season. Newcomb, on the other hand, is a pitcher that has a .139 career OPS. So, wouldn’t you know it, because baseball gonna baseball… Buehler walked Newcomb on four pitches to give the Braves a 1-0 lead. And it gets much, much more difficult after the pitcher’s spot in the Atlanta order- 20-year-0ld star Ronald Acuña Jr. — owner of a .913 OPS and 143 wRC+ — is the leadoff hitter. It appeared Buehler walked Acuña as well, and that would’ve been the case with robot umpires. But home plate umpire Gary Cederstrom incorrectly decided this 3-0 fastball was a strike. That actually turned out to be a break for the Braves. Acuña sent the next Buehler offering over the left-center field wall, for a grand slam. So what appeared to be a pretty easy way out of a jam for Buehler quickly turned into a 5-0 deficit. 99 batters faced, 2 ER, 0 HR. Then gave up 4 ER on one swing by Ronald Acuna Jr. However, Buehler settled down, and was able to only allow those five runs over five innings. And the Dodgers scored two runs in the third and three runs in the fifth to tie the game at 5-5. But the Braves got the lead back on a Freddie Freeman solo shot in the sixth, and held off a Dodgers rally attempt in the ninth to come away with a 6-5 victory.